Name: Latin vinci = conquor + toxicum = poison. 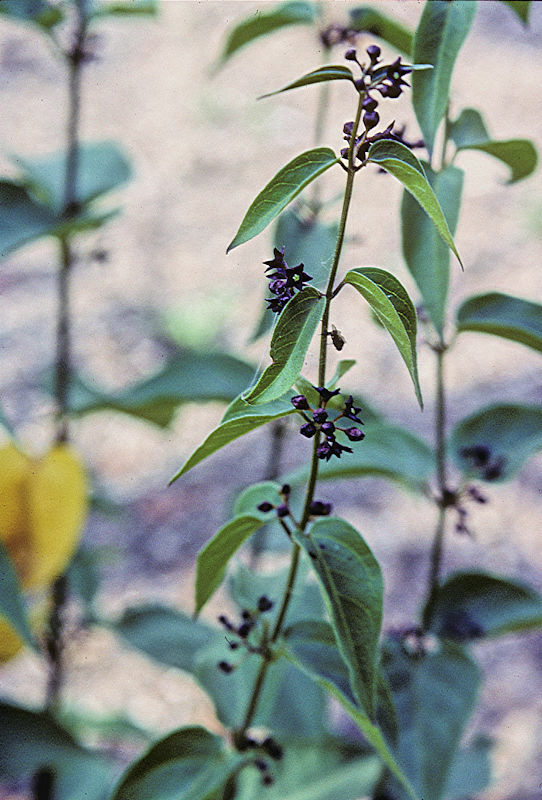 Vincetoxicum is a group of perennial climbing leafy vines. In the absence of shrubby vegetation, the stems twine around each other forming a ropy mass. Leaves are opposite and heart-shaped to lanceolate. Umbels of green to purple flowers, with the scent of rotten fruit, arise from leaf nodes and are followed by pairs of dehiscent seed pods. As with other Asclepiadaceae the seeds have a silken parachute which assists dispersal by the wind. 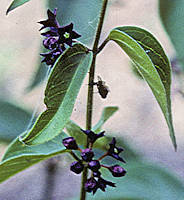 Vincetoxicum is distributed throughout the tropical American continent, Europe (18 species) and Asia. There are no native North American species but some European species have become invasive weeds as far north as Canada. Vincetoxicum has been included in Sarcostemma and Cynanchium but is now recognised as a separate genus. The toxic sap is supposedly an antidote to venom, hence the genus name. 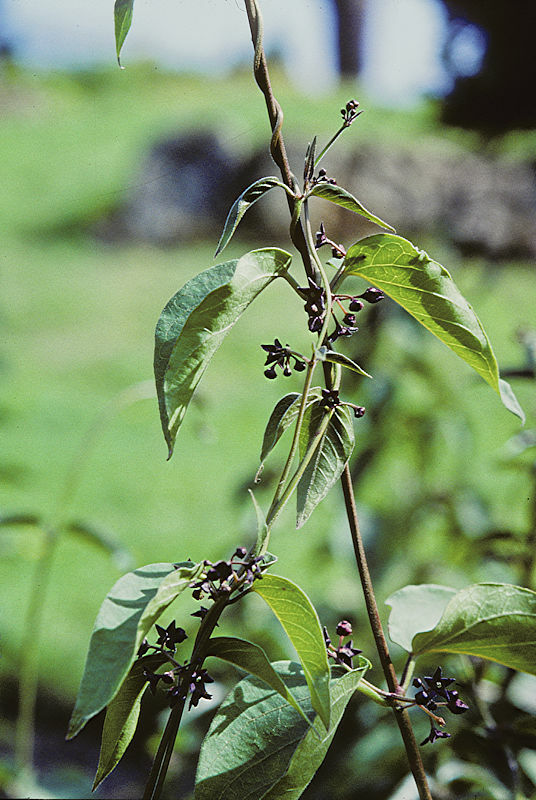 Herbal preparations of some species are sold as immune-system stimulators. Several species in this genus are listed as invasive weeds and are best cultivated in pots with a climbing frame, where they can be kept under control. Ideally, seed pods should be picked before splitting and wind dispersal of seeds can occur. This species produces a climbing top growth with opposite pairs of dark green ovate leaves. 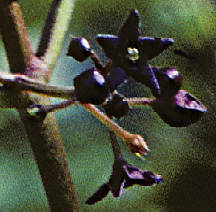 Clusters of small 5-petalled flowers, of a sufficiently dark purple to appear black, are produced from leaf axils. One could justifiably include Vincetoxicum scandens in a collection of black plants. Flowers have pale greenish centres. Native to S. & E. Ukraine and S. Russia. The root is frost hardy in a pot on my patio, although the top growth dies down each Autumn. The vining growth has to be encouraged to use the climbing frame in the pot. Otherwise it will trail over the sides or the pot and wrap around itself.